This may or may not be the scene of many nights around here. 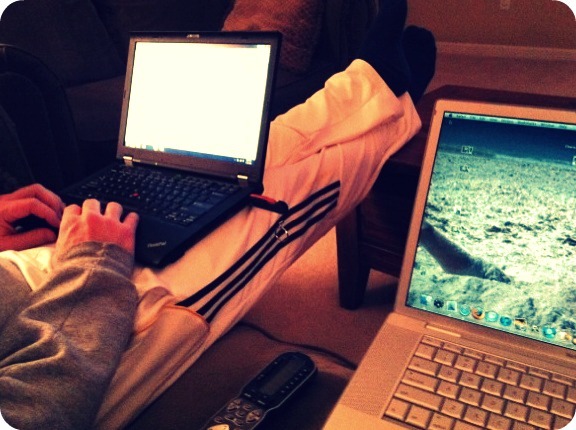 Justin with his laptop, me with mine. Exciting. I know. Point is, the kids definitely take notice and want to join the fun. Or the not so fun...er, you know what I mean. They like pretending they're "checking their email" or "looking at the weather" on one of our old laptops and it was allowed as long as they played nicely. This ended the other day when Vaughn tried to dismantle the keyboard, in true pesky younger sister fashion. I saw Vance go to grab it today after school and I asked him to play with something else because I didn't want to deal with the loose keys. Vance, taking matters into his own hands, created his own laptop. Except he was calling it a "blacktop" by mistake and I had no idea what he was talking about until I got a closer look. I couldn't contain myself. I mean, he made his own laptop. 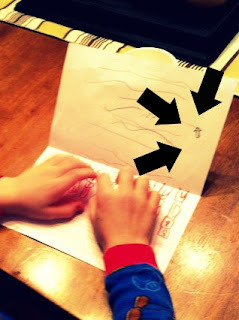 He even drew the arrow cursor. The only thing I forgot to ask him was if it was a Mac like Mommy's or a PC like Daddy's. My money is on the fruit. Be creative and have a great day! 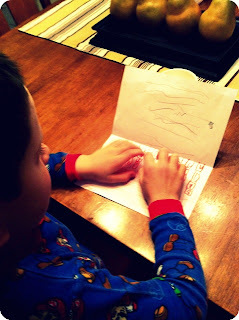 He is so creative, just like his Momma! I love that he put the cursor there too. If we had two laptops at our house, I am sure our scene in the evenings would look just the same. Samuel last night got out his play laptop and said he needed to check his email too.